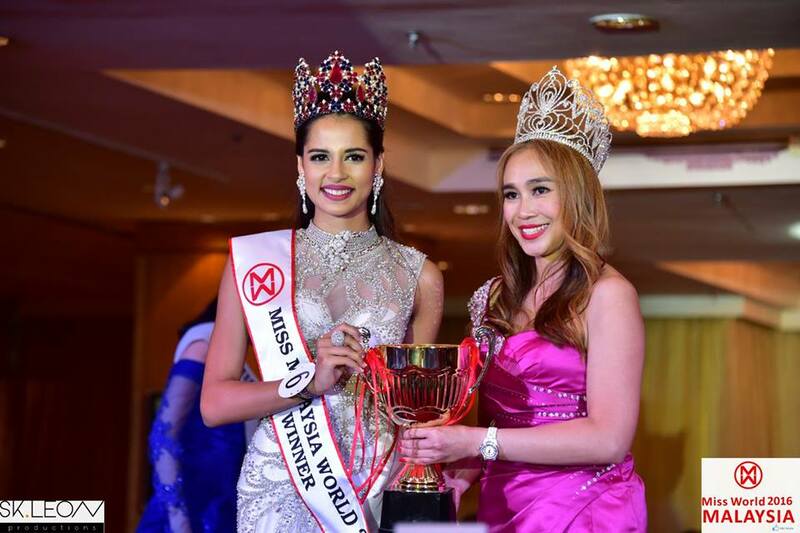 Miss Malaysia World Tatiana Kumar Stripped Off Title For Making "Offensive Comments"
She has been replaced by Miss Malaysia World 2016 1st runner up, Shweta Sekhon. The Star reported yesterday evening, 6 March, that the Miss Malaysia World committee has revoked the 18-year-old's title for posting comments that are deemed "offensive". 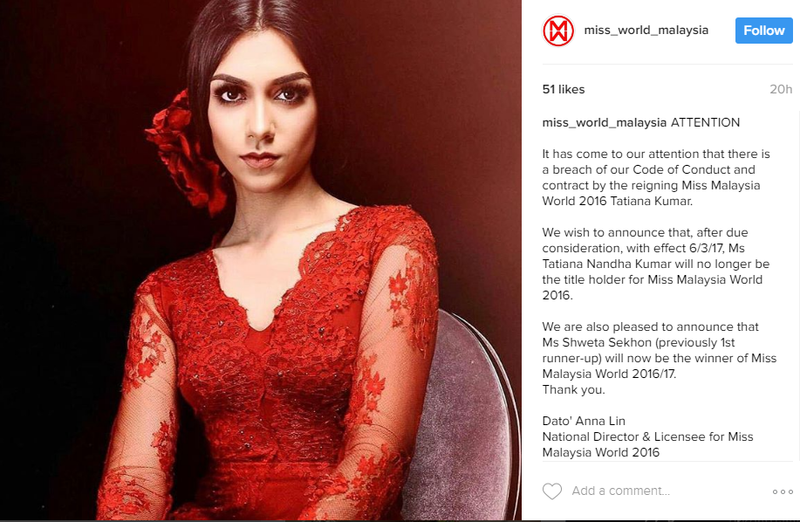 Miss Malaysia World made the announcement on their Instagram account and it was signed off by former national director Anna Lin. "There are certain formalities, and she has also breached one involving an important sponsor. This has led to the contract being terminated," Lin told The Star. She explained that Tatiana and her family had posted several posts on social media sites, namely Facebook, that have "offended" the organisation. What "offensive comments" did she make? 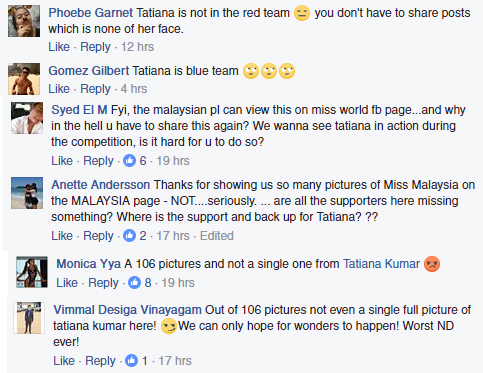 On 11 December 2016, Tatiana posted a Facebook comment before the Miss World 2016 competition that was held on 18 December 2016 in Maryland, United States, stating that she has not been made one of the admins for the official Miss World Malaysia Facebook page. 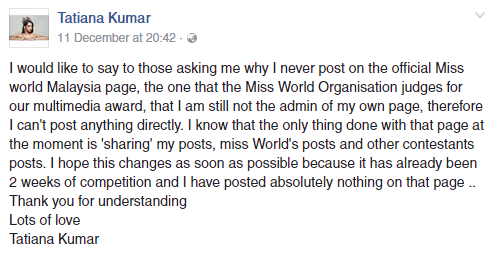 An article by Vulcan Post on 14 December 2016 said that when Tatiana was in the running towards becoming Miss World, she posted a status on her Facebook page, claiming that she hasn't been able to post statuses and updates on the official Miss World Malaysia page as she wasn't granted the permission to be an admin of the page. It was reported that Miss World contestants are also judged based on the 'Multimedia Challenge' which requires them to win points by interacting with fans on social media sites to create engagement. 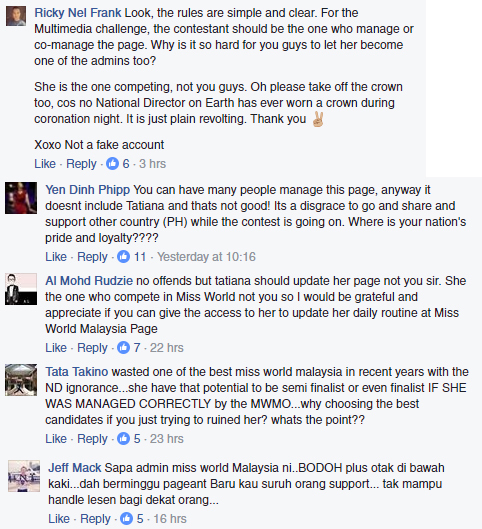 It was said that the admin of the Miss World Malaysia page shared more updates about other Miss World contestants instead of prioritising Tatiana, as the Malaysian representative for the competition. Even Tatiana's father, Kumar Nandha, posted a status, expressing his disappointment over the way Tatiana was being treated by the Miss World Malaysia organisation. He claimed that she was forced to tap dance on a carpet during the Talent round and that they should have provided her with a wooden platform. 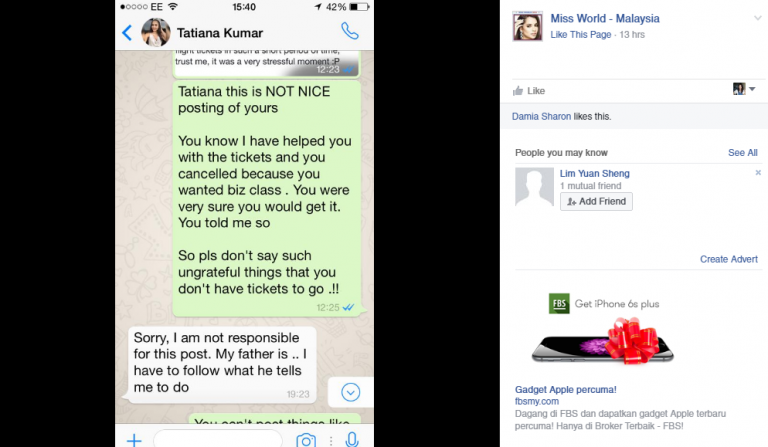 On 25 November, Tatiana posted another Facebook status on her page, alleging that she wouldn't have been able to fly to the US for the final round of the Miss World competition without the assistance of Tourism Malaysia. She had given no further explanation as to what led to her ending up in this situation. Her status got the comments section brewing with questions on why was she made to use her own expenses and effort to get the flight tickets when it should have been taken care of by the National Director of the Miss World Malaysia organisation. 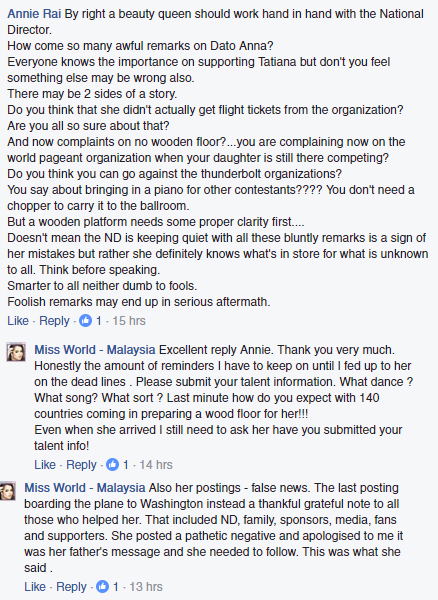 Responding to one of the comments on Tatiana's Facebook post about the flight tickets issue, the Miss World - Malaysia admin claimed that they had asked for the Malaysian beauty queen to provide them with the needed details regarding her talent round performance but had received nothing till the very last minute. "Honestly, the amount of reminders I have to keep on until I fed up to her on the dead lines. Last minute how do you expect with 140 countries coming in preparing a wood floor for her? (sic)" read the comment by Miss World - Malaysia Facebook page. They also went to the extent of uploading conversations between the organisation and Tatiana regarding the flight tickets, pointing out the fact that that they had indeed provided her with flight tickets but she had apparently declined them as she wanted business class seats. Tatiana's response to the message read, "Sorry I am not responsible for this post. My father is... I have to follow what he tells me to do." The screenshots posted by Miss World - Malaysia Facebook page on this issue have already been removed from the page. Responding to the termination, Tatiana has called it "wrongful and wholly unjustified"
Responding to the termination of his daughter's Miss World Malaysia title, Tatiana wrote a Facebook post claiming that she has not breached the agreement or Code Of Conduct. The letter alleges that Tatiana has breached the agreement she entered into as Miss Malaysia World 2016 with Meridian Surf Sdn Bhd. "The termination of the Agreement and the removal of my title are wrongful and wholly unjustified, as I have certainly not breached the Agreement or any so-called Code of Conduct." "More importantly, the allegations made against me are wholly false and unacceptable. I am very upset and disappointed with these allegations as I have conducted myself with utmost professionalism as Miss Malaysia World 2016 to-date," read her post. She informed that she is in the process of seeking legal counsel over the matter and will not be making any other statements regarding the termination of contract. Supporting his daughter's statement, Tatiana's father has stressed that his daughter has "done nothing wrong"
Tatiana Kumar was crowned as Miss Malaysia World 2016/17 on 27 August 2016. Kumar Nandha had confirmed that Tatiana was served a legal notice about the termination via email on 3 March, as reported by The Star. Tatiana has been replaced by Miss Malaysia World 2016 1st runner up, Shweta Sekhon. The 19-year-old is officially the new Miss Malaysia World 2016/17. Shweta Sekhon, Miss Malaysia World 2016/17. Do you think the Miss World Malaysia organisation did the right thing by stripping Tatiana off her title? Let us know what you think in the comment section below! Kiran Jassal will be parading the futuristic jumpsuit in the Miss Universe final in Philippines later this month. A new chapter is about to unfold for Chatime Malaysia.